Undoubtedly the goal for reforming the Constitution of Grenada is to clear the way for replacing the London-based Privy Council with the Caribbean Court of Justice (CCJ). This is not the case only for Grenada but for all of the CARICOM countries which do not have the CCJ functioning to its ‘fullest extent’. The failed Reform in Saint Vincent and the Grenadians (SVG) and the concern not to have this happening in Grenada must be put in perspective. It was never the intent of the government in SVG to have drastic changes in National Governance and Executive Powers, but rather to succeed with the CCJ. The ploy for Grenada is to have a ‘piecemeal reform process with clusters of referenda’, and having the CCJ issue paramount in the first cluster; but with no determination and direction of plans thereafter. This is a ridiculous proposal when there are so many incidental amendments along with the claimed less-controversial CCJ issue, which would cost the financially-trapped country almost two and a half million Eastern Caribbean dollars to undertake the Reform; and also bearing in mind that there are loud wide calls for outstanding substantial issues to be met in rectifying the 1974 Independence Constitution. The so-called National Public Consultation which was held by the Constitution Reform Advisory Committee on 15 October 2014 at the Trade Centre in St George, was revealing on many aspects; notably on the flawed process for the Reform. Sentiments echoed on the ‘adamant and arrogant rush’ with the effort for the Reform which is not yet absorbed and settled by the people. It must have been an awakening when the Grenada Trade Union Council (GTUC), whose large and diverse constituents touch the working class and extend to the masses, indicated that the CCJ must be given some time to prove itself before Grenada endorses it as the Final Court; there are still some genuine uncomfortable areas. The main reason for a Constitution is to facilitate Good Governance within a particular political philosophy; and reforming a Constitution is to achieve Better Governance, considering that the political philosophy is well defined and accepted. Good Governance speaks to the observance and application of the Rule of Law, within Moral and Natural Justice and moderate Democratic Principles as adopted. Critically; a Constitution embeds a Legal Order with a purported independent Judiciary as part of government, and this seems to be most challenged by the efforts for Constitution Reform in Grenada. The idea to develop an indigenous Court, such as is the CCJ, is ambitious and laudable. However, the idea to effect the CCJ without conducive conditions and suitable systems is appalling. The promotion of the claims for particularly acceding to the CCJ as the Final Court of Appeal is a farce with an intent to mislead the masses. The people must therefore be warned and watchful, since Justice would be elusive with the CCJ and there would not be any avenue for recourse or return on the matter. There is no question that despite the great advantages that can result from a properly instituted Court, as it stands presently, the CCJ is less credible and reliable as compared with the Privy Council. The Privy Council has proven its worth and is still valid, within reasonable consideration of all pertinent factors. The public is not aware of any official communication on the Privy Council abandoning the Caribbean and directing it to the CCJ, as is being made to be believed. In fact, British Jurist Lord Phillips often-used 2009 remark, specified “in an ideal world” for having “own final courts”; the question then comes, has the Region achieved this standard? The CCJ is prone to ‘non-integrity operations’ which worsens Governance and threatens Democracy. Indeed, “the devil lies in the details” on the promotions in favor for the CCJ, as for most of the other issues for the Reform; critical ‘context and content’ are concealed. A pre-requisite for the ultimate readiness and acceptance of the CCJ must be Legal Reform. Universal ‘easy’ access to the CCJ is impossible with a disarrayed and questionable local legal system which already disadvantages the masses. Regulations under the Eastern Caribbean Supreme Court need to be reviewed and reconciled to ensure due process and the enforcement of judgements of the CCJ. The history of political intrusions and influences in the Judicature is known, and the CCJ is not immune from this plague when personnel and institutions in the Region are tightly intertwined. Officials have advanced “approachability” as a benefit of the CCJ, but who is most privileged to be in contact with this Court? Definitely not the masses, but the status quo which is now trying to strengthen and entrenched its kingdom with the power of ‘total jurisdiction’ of abuses against the masses within the domain! Grenadians must demand answers to some related questions on their special position with the administration of justice, before they decide favourably for the CCJ. These would include at least; what is Grenada’s yearly contribution to the Eastern Caribbean Supreme Court? What is Grenada’s yearly contribution to the London-based Privy Council? What is the contribution made on Grenada’s behalf to the Trust Fund of the CCJ and what is the yearly repayment required? What are the obligations and preparations which Grenada must meet when the CCJ sits locally? How many cases are taken to date by Grenada to the CCJ in its Original Jurisdiction since its existence? Unless the Grenadian public is satisfied that the electorate can make sound judgement on any upcoming referendum for the Reform, then they should prepare to encourage a Vote No. There is no harm in waiting; when in doubt stay out. The CCJ issue speaks to the ‘deception and insensitivity’ of the politicians. This issue never appeared on any of the 2013 election manifestos. The strategy then is to disguise the issue with sensationalism and trivialities, and to confuse the people in the Referendum. It must be noted that Grenada’s accession to the CCJ will definitely not bring investments, create jobs, nor solve the economic and social problems; definitely not relieve the huge public debt and the clutches of the International Monetary Fund (IMF); and definitely not advance Good Governance and improve the Administration of Justice. The CCJ must allow to build but not at the expense of the poor and vulnerable in the society. There is no convincing and commendable case, except conjectures and compulsions, for the CCJ. Trade litigations are not yardsticks for criminal, civil and constitutional matters. The declaration of Dominica’s Prime Minister Roosevelt Skerrit, as Chairman of the Sub-grouping earlier in 2014, to have all countries of the Eastern Caribbean acceding to the CCJ must be frightening, especially within the context that nothing has been said about the ‘ugly governance’ issue of no-confidence vote in St. Kitts and Nevis, which is lingering for some years now. The argument that Grenada already had a Final Court under the PRG is hogwash, since it was described as a Kangaroo Court and was rejected even by its own designers. The writing is already on the wall pointing to possible debacle of the CCJ, with justice at risk for the people. Concerns and gripes about the CCJ are substantial, and the local population must not be carried-away by superficial, partisan and emotional influences otherwise. No other people, than Grenadians, should know about mistrust in Government, considering the predicaments from reckless policies and reneging on promises. Public officers are especially cautioned to be aware that their constitutional pensions entitlement is in limbo (although with a balance more in their favour) but the CCJ would seal its fate in favour of the Government, with the unconstitutional Pensions Disqualification Act. 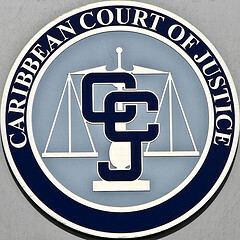 Strong references can be obtained through the Internet on pending problems of the CCJ in terms of its cost, operations and longevity; for example : “Mounting Embarrassments surrounding the Caribbean Court of Justice”; “New funds needed for CCJ”; “OECS opposition parties urged to reject CCJ”; “Hope is dying for the CCJ”; “A critique of the Caribbean Court of Justice” (University of the West Indies, 2004); and “ . . . The CCJ Convicts Itself”. Also of interest is, “Caricom and Constitutional Reform”. As a final point to put to rest. It would be ‘insane and unbecoming’ for the United Kingdom to withdraw abruptly the Privy Council from a Commonwealth nation. There is therefore no need to panic on this!